Only fragments of Thomas Johnes' glittering collection of Renaissance stained glass survive at the Church of St Michael, Eglwys Newydd, Hafod (Cwm Ystwyth). These remnants of perhaps the best collection of its kind in Wales were salvaged from the fire at the church in 1932, after the rest of the collection perished in the 1807 fire at Thomas Johnes' house at Hafod. Very little has been published on the surviving fragments until now, and all of the main roundels and diamonds are generously illustrated in the book. A large-scale colour plan of the five way-marked walks, overlaid on an aerial photograph. Includes commentary on each walk and additional information. A fully illustrated account of the estate's history, its importance to the Picturesque, and its recent restoration, with detailed descriptions of the walks. 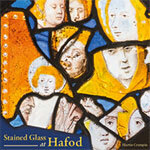 Over 60 historical and modern views of Hafod's most notable features and walks, with explanatory text. 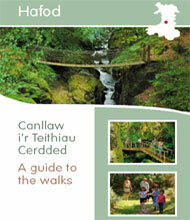 Also includes illustrations of Devil's Bridge and Cwm Rheidol.